The main purpose of the DETEXI Network Video Recorder is to record and archive live video for later replay and analysis. After the camera was generally defined in the NVR it has recording enabled by default — the Exclude from recording checkbox is unchecked. Turning on recording requires at least one schedule to be added and configured for the camera; type of recording, and motion settings (if appropriate) defined. To optimize performance disable recording for the cameras that are not intended for recording. Thus the Recorder will ignore those cameras completely, freeing resources for other tasks. In the Cameras Settings check Exclude from recording checkbox to disable recording for the camera. Click Save button below the Cameras List to save changes. Recording can be temporarily disabled for a camera without removing recording schedules and configurations by using Exclude from recording checkbox. If recording is enabled again later (the checkbox is unchecked again), all previous recording schedules and configurations will be restored. There are two NVR Services that should be running and monitored by the Monitor service in order to record — Recorder and Check Drive. When the services are running the icons will show in the System Tool Tray. Double-click the recorder icon — the NVR Recorder service interface will launch. Click Get Recording Cameras button to get the list of cameras showing active to the Recorder. If you see live video, the recorder is either analyzing that video for motion, recording that video to the archive, or both. If you see a no connection image with a [Port-alarm] notation, it indicates that although the camera is being monitored for I/O Port Alarms, the video is not currently being recorded. If you see a no connection image without a [Port-alarm] notation, this means the recorder should be either analyzing the video for motion, recording it to the archive, or both, but has temporarily lost connection to that camera — the connection to the camera should be checked. Minimize the window to return it to the System Tool Tray. Do not close the window — it will stop the Recorder service. A flashing red light on the check drive icon indicates that the Check Drive service is busy. This could mean that it is executing the daily archive clean-up, constantly overwriting data because the Minimum Free Space limit was reached, or attempting to connect to an unavailable directory or drive. Schedule based recording can be set up as continuous (24/7 or other) with or without motion detection or triggered. An alarm-triggered recording can be activated by, for example, video motion detection or an external input through a camera’s input port. Scheduled recording can combine both continuous and triggered recording instructions (within schedule). 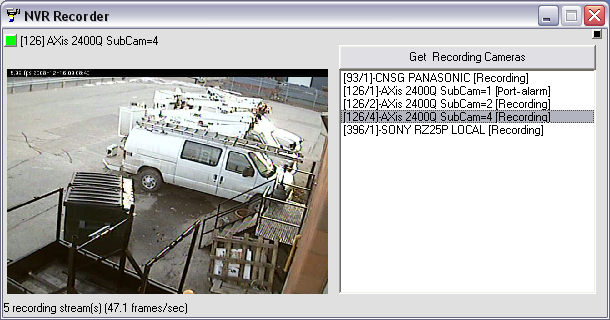 Recording with no motion detection — video is archived constantly while on schedule, with no motion analysis being done. 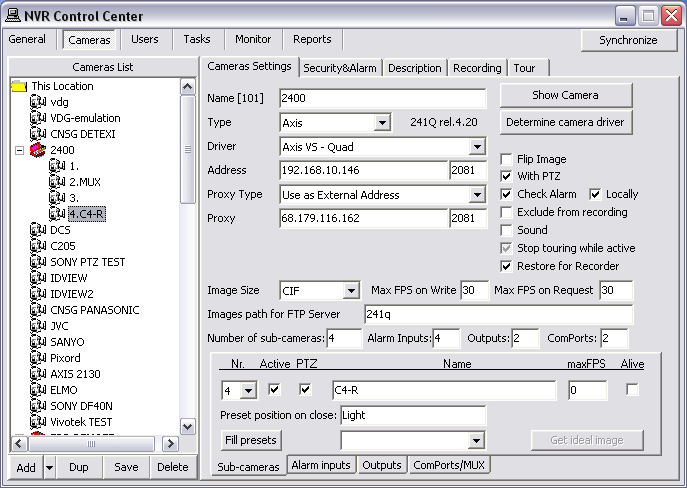 Recording on camera input alarm — the hard input(s) of the camera are monitored while on schedule, and when an alarm is detected on the input(s) video is archived. Although this is event based recording, it still relies on a schedule. Recording on NVR event (Recording Task Action) — video is archived for any defined camera when a chosen event occurs in the NVR. Schedule-based continuous, scheduled and recording only on motion are the most basic recording options. Event-based recording is discussed in the NVR Events and Alarming.